With the help of The Red Shore's Roman Koester at Complex Studio, Dropsaw have managed to lay down a darker sounding second offering. The axes are heavier and sharper with riffs that'll go through you like a blade through a hookers throat, drums that pound like a hammer into a spouses skull and thick as spilt blood bass lay the foundation for vocalist Jared McIntosh's finest and most aggresive vocals to date. 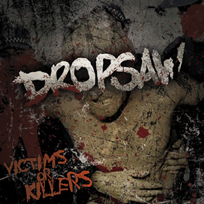 'Victims Or Killers' also features guest vocals from Mindsnare's Matt Maunder. Place your order here.